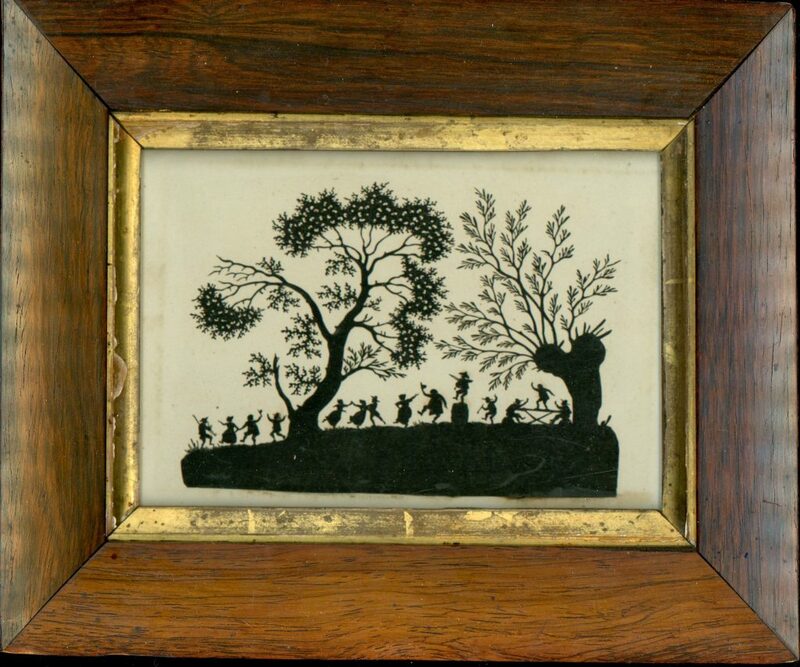 Alongside professional silhouette portraiture, paper-cutting was a popular pastime for young ladies and children throughout the late eighteenth and nineteenth century. Inspiration for subject matter came from everyday life in the home but also from book plates. Tiny razor-edged scissors were typically used as well as quill-shaped knives with a hone and oil to sharpen them. This art, also known as Scherenschnitte, was fashionable at the Court of George III whose daughter Princess Elizabeth was an ardent cutter. This captivating scene shows a merry group partying in the woods, the older men perched on rocks drinking whilst the younger folk dance to music played on the fiddle and the hornpipe. Each figure has been expertly cut to capture the movement and liveliness of the moment. Dating to the early nineteenth century, the cut-paper picture is held in a period rosewood frame with a gilt slip. Some small old glue marks (under visible under a glass) and a shadow line from an old mount are the only small apologies to note.